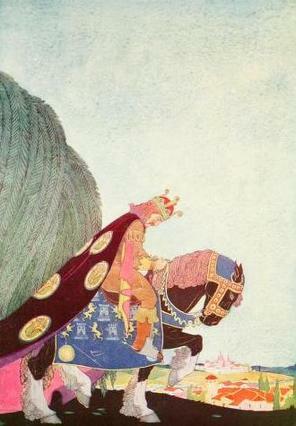 “The King returned to the palace with a sad heart.” Illustration by Maude and Miska Petersham. Published in Tales of Enchantment from Spain by Elsie Spicer Eells (1920), Harcourt, Brace and Company. Read Spanish fairy tales, folk tales and legends by authors like Elsie Spicer Eells. These Spanish fairy tales include translated works from areas like Catalonia, Spain — which gives us tales like The Water of Life, as collected by Andrew Lang for the Pink Fairy Book. Eells’ collection is Tales of Enchantment from Spain, and features Spanish fairy tales she translated.